Thom Browne is an accomplished menswear and womenswear designer who operates slightly under the radar. He isn’t exactly a mainstream designer—his work is devilishly unique, rivetingly perverse. His unparalleled commentary, coupled with his razor-sharp attention to detail and tailoring contribute to him being a talented menswear designer. When you step foot in his Dover Street Market concession in London, you enter the world of Thom Browne: it’s a confined space, slightly claustrophobic, but mesmerising in the same respect. In a morbid, greyscale world devoid of colour, the boys wore variations of suit clung to the models’ bodies like paint. The seams were lined with buttons; like sinister eruptions bursting from the fabric. As the show progressed, so did the proportions. Distorting suits, Browne’s boys wore deconstructed two-dimensional outfits… Rei Kawakubo would be impressed. They questioned what could be considered fashion, and in this climate, we well know that anything goes. That was the point of this collection, if you ask this critic. It was a mockery of what fashion has become. There is no register of what is considered good or bad anymore. Quality vastly diminishes as seasons pass by. It has also become incredibly boring. Writing, editing and rereading my own New York Fashion Week or Milan Fashion Week commentary alone can border worry—I become a broken record, lamenting the loss of creativity at fashion week more and more. 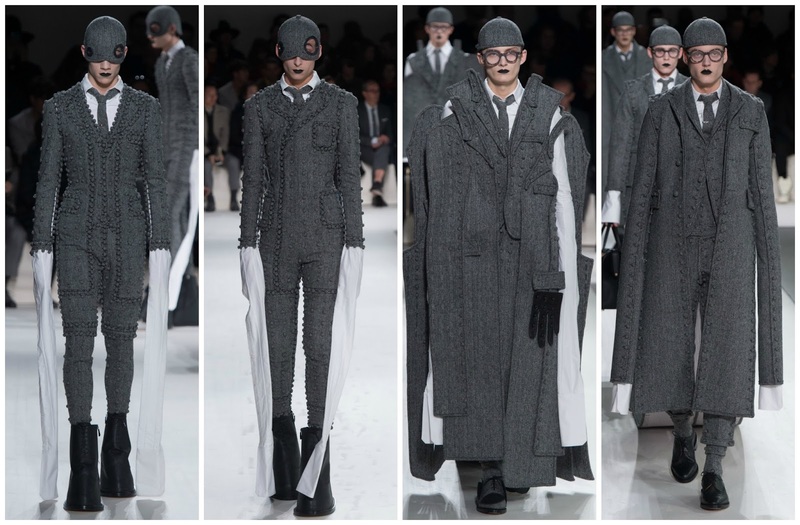 Thom Browne’s greyscale show, the slow pace of his models, the mundanity of suiting as a thematic influence—it was an intellectual dream, a takedown of normcore, but intelligently becoming and manipulating the very thing it mocks. His mordant lucidity and sense of self as a designer is remarkable. He poses the question, “is fashion entertainment?”, and concurrently answers it, “yes” is the answer. The sardonic nuances and unabashed bleakness aren’t much different to that of the world we live.